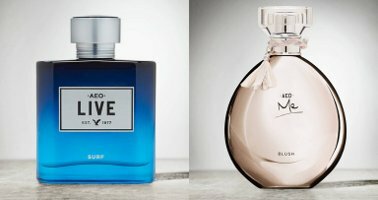 American Eagle has launched two new fragrances, AEO Live Surf for men and AEO Me Blush for Women. AEO Live Surf ~ a flanker to 2001's Live. "A fresh, aromatic blend with a touch of green, evoking the feel of waves crashing on the shore." With lush green freshness, watery accord, moss, violet leaf, cedarwood, vetiver and musk. AEO Me Blush ~ a flanker to 2012's AE Me. "A citrusy, floral scent with a touch of woods to bring out your inner romantic." With pink grapefruit, raspberry, apple, apricot blossom, jasmine, freesia, sandalwood, musk and amber. American Eagle AEO Live Surf and AEO Me Blush are available in 50 ml "Fragrance". Me Blush sounds like something from a conversation between Tarzan and Jane.